"Game & Watch was a portable LCD game device sold by Nintendo in 1980. In addition to including both a game feature and a watch feature, its pocket-sized dimensions made it a popular platform for portable gaming. Since the release of Ball in 1980, the platform evolved to include wide-screen and multiple screen options, and now the three most popular games from the Game & Watch platform, Oil Panic, Donkey Kong, and Greenhouse, are available for the Nintendo DS." 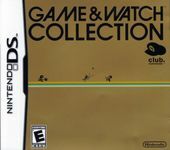 Game & Watch Collection is available exclusively through Club Nintendo, Nintendo's rewards program.